You are at:Home»Caught In The Act»GUY CLAIMS HE GOT NEW NOTES WITH SAME SERIAL NUMBER. BUT…. GUY CLAIMS HE GOT NEW NOTES WITH SAME SERIAL NUMBER. BUT…. 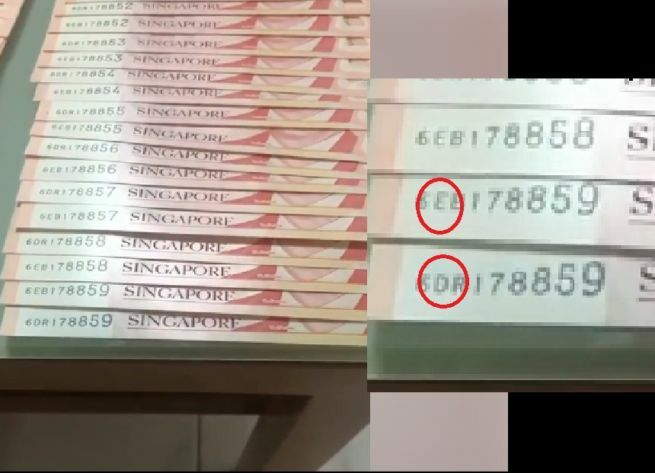 Beware of this video of a man that posted and claim that the money has the same serial number. If you look carefully the alphabets are different so the serial number on the $10 notes ARE NOT THE SAME. This guy eat full nothing better to do all the eye got stamp. Different alphabet same number so its not counterfeit. All Real, happen to my friend got directly from bank. the difference on the Alphabet…👍 Knn, eat too full got nothing to do!!!??? Next Article MAN CLAIMS HE BLOCKED BY RYDE FB AFTER ASKING FOR REFUND. BEWARE!